The landscape gardener, Humphry Repton, died 200 years ago on 24 March 1818. 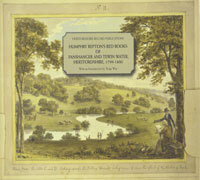 Among the events commemorating his life and work is the publication of the Hertfordshire Gardens Trust’s “Humphry Repton in Hertfordshire”, edited by Sue Flood and Tom Williamson. Professor Tom Williamson will be speaking at the launch on 19 April 2018 (18.00 – 20.00). The venue is at HALS, tickets are £5.00. 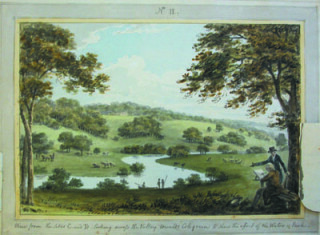 Humphry Repton changed the landscape of many Hertfordshire estates, notably Panshanger and Ashridge but also some lesser known, which are recorded in his “Red Books”, such as Tewin Water, New Barnes and Wall Hall. What sort of man was Humphry Repton? John Byng, in his description of his Tour to the North in 1792, recorded a meeting with him. Byng set off from London on 26 May on the Paddington Road and on reaching Elstree Hill stopped to admire the prospect. “What view finer? 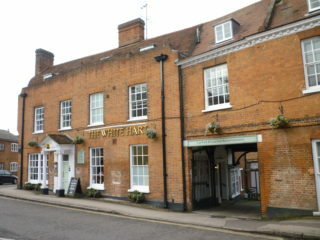 What village pleasanter?” Some showers put him in “a melancholy mood” and he continued via Park Street hamlet to “the pretty village of St Stephen, just above St Albans, where I put up at the White Hart at half past three o’clock; and such an inn is scarcely to be found of filth, inattention and charge“. He therefore continued his journey via Sandridge and joined the North Road and so “arrived at Welwyn, where the White Hart appear’d magnificent after that of St Albans” and enjoyed a dinner of Eel (1/6d), bread and cheese, brandy and wine. He set off the following day to the Sun Inn at Biggleswade. On the 28th was preparing to ride “but Mr Repton, the now noted landscape gardener, came in and delay’d me for half an hour: he is a gentleman I have long known, and of so many words that he is not easily shaken off; he asserts so much, and assumes so much, as to make me irritable, for he is one (of the many) who is never wrong; and therefore why debate with him?”. Was this a secret of his success? Did his clients become so bored that they walked away with the words – “just get on with it”? ”The Torrington Diaries: containing the tours through England and Wales of the Hon John Byng – 1781 – 1794″ is available, for reference only, at HALS Call number 942.073. John Byng was a son of the 3rd Viscount Torrington of Southill, Bedfordshire. The family seat had been sold by his older brother and so Byng used “The Sun” as “his home in Bedfordshire”.